WASHINGTON — A United Launch Alliance Atlas 5 rocket lifted off Oct. 8 from Vandenberg Air Force Base in California carrying a classified payload for the U.S. National Reconnaissance Office. 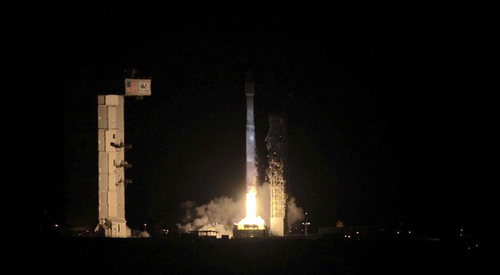 Liftoff of the NROL-55 mission occurred at 5:49 a.m. local time. Almost all missions for the NRO, which buys and operates U.S. spy satellites, are classified, meaning few details are released. 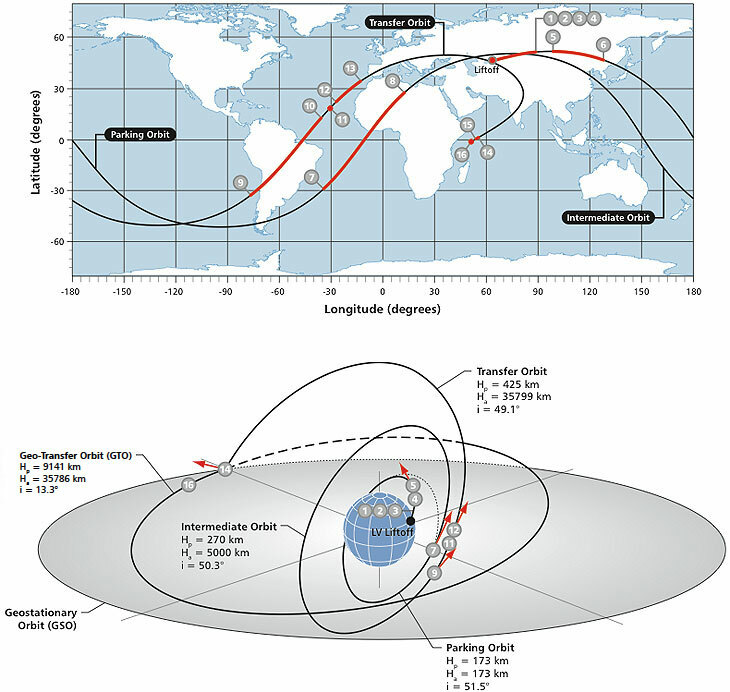 However, the West Coast launch site suggests that the satellite or satellites were destined for a high-inclination orbit, which is ideal for imaging and other missions that require synoptic global coverage. The NRO did say the launch included an auxiliary payload known as the Government Rideshare Advanced Concepts Experiment, or GRACE, which carried 13 cubesats. The GRACE carrier was attached to the aft end of the Atlas 5’s Centaur upper-stage engine. Nine of the cubesats were sponsored by the NRO, with the remaining four sponsored by NASA. Among the NRO-sponsored cubesats are three experimental communications satellites for the U.S. Army’s Space and Missile Defense Command. The SMDC Nanosatellite Program, or SNaP, cubesats each weigh about 4.5 kilograms and will be used to help develop radios that provide “beyond-line-of-sight communication for disadvantaged users in remote locations,” an NRO fact sheet said. 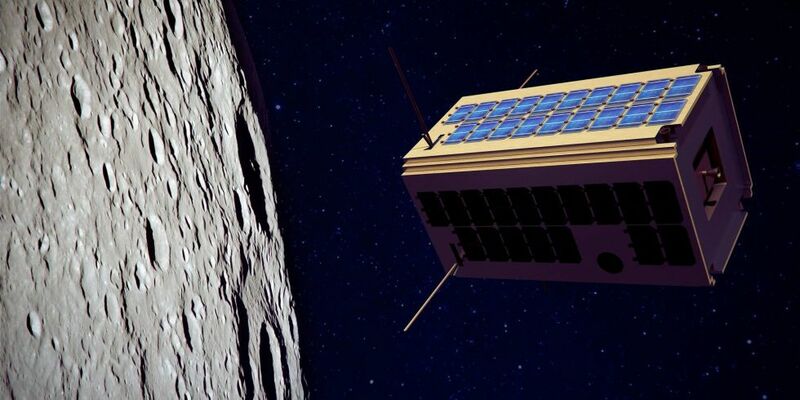 The other NRO-sponsored cubesats include two from the Aerospace Corp. to demonstrate tracking technologies and laser-optical communications; two from Tyvak to perform ionospheric calibration measurements; and two from SRI International to demonstrate software defined radio communications. The NASA-sponsored cubesats were developed by the University of Alaska, Fairbanks; Salish Kootenai College; the AMSAT amateur satellite radio organization; and the Jet Propulsion Laboratory. NASA and the scientific community are trying to stay upbeat and positive following the failure of one of the two main instruments on the agency’s Soil Moisture Active Passive (SMAP) satellite, saying the mission will soldier on and conduct meaningful science with its remaining sensor. That’s well and good, but there’s no whitewashing the reality that a billion-dollar mission now will not meet its basic science objectives. For reasons NASA has yet to determine, or at least fully disclose, SMAP’s active radar sensor suffered a component failure and ceased operating in July, just two months after the high-priority Earth science mission, which launched in January, completed on-orbit testing. NASA announced Sept. 2 that it had ended efforts to resuscitate the sensor, designed to bounce radio signals off Earth to make high-resolution soil moisture maps. The agency said the otherwise healthy spacecraft would carry on with its passive radiometer instrument, which has much-coarser spatial resolution than the radar but takes more-accurate moisture readings. SMAP was designed to create high-fidelity global maps, updated every two to three days, of soil moisture and freeze/thaw states to help scientists better understand how both factor into seasonal and climate changes. The mission, also expected to aid the prediction of floods, drought, agricultural productivity and weather, was one of four endorsed for implementation in the near term by the National Research Council in its 2007 decadal survey of Earth science priorities. 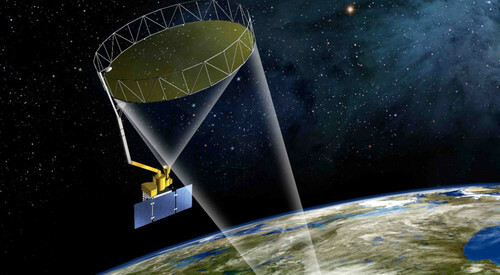 “Although some of the planned applications of SMAP data will be impacted by the loss of the radar, the SMAP mission will continue to produce valuable science for important Earth system studies,” Dara Entekhabi, SMAP science team lead at the Massachusetts Institute of Technology in Cambridge, said in statement that accompanied NASA’s release of the bad news. NASA Earth Science Director Michael Freilich struck a similar tone, suggesting that even the degraded mission satisfies at least some of the scientific objectives laid out in the decadal survey. “Measurements of the radiometer-only SMAP mission will advance that science and form the basis for a host of applications consistent with the recommendations in the decadal survey,” he said. The LISA Pathfinder deep-space science payload for Arianespace’s next mission with its Vega launcher has been delivered to South America for an early December liftoff from the Spaceport. LISA Pathfinder was shipped from Airbus Defence and Space’s Stevenage, U.K. facility for delivery to French Guiana, where it touched down at Cayenne’s Félix Eboué Airport this morning aboard a chartered Antonov An-124 cargo jetliner. After being lofted on December 2 by Vega, LISA Pathfinder initially will be placed in a slightly elliptical parking orbit. The spacecraft subsequently will use its own propulsion module to reach the final operational orbit: a 500,000-km.-by-800,000-km. halo orbit around the first Sun-Earth Lagrange point, 1.5 million km. from Earth. LISA Pathfinder will help test and validate the technology in space needed for detecting low-frequency gravitational waves – which are ripples in space-time predicted by Albert Einstein’s theory of general relativity. The spacecraft also will measure gravitational waves generated by objects such as collapsing binary star systems and massive black holes. 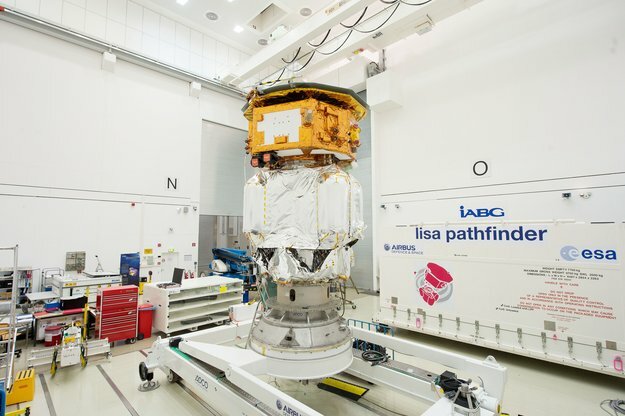 Developed in a European Space Agency program, LISA Pathfinder was produced under the management of prime contractor Airbus Defence and Space in Stevenage. Its liftoff mass will be an estimated 1,900 kg. 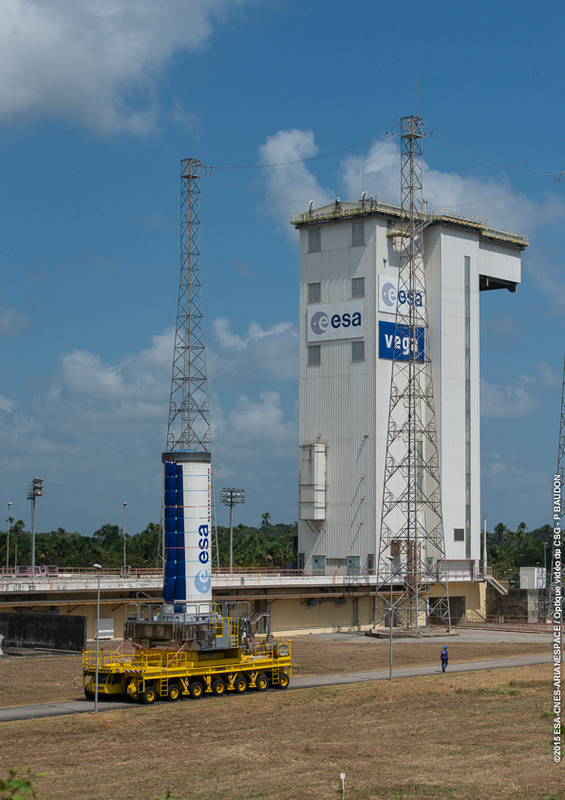 Vega is the smallest member of Arianespace’s launcher family, which also includes the medium-lift Soyuz and heavyweight Ariane 5. The light-lift Vega is produced under the responsibility of industrial prime contractor ELV, a company jointly owned by Avio and the Italian Space Agency. The December 2 mission with LISA Pathfinder will be Vega’s sixth since the launch vehicle’s maiden flight from the Spaceport in 2012. 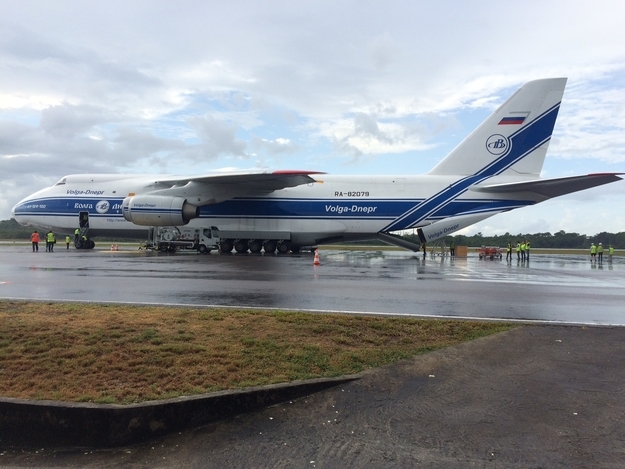 The protective shipping container with LISA Pathfinder is unloaded from an An-124 cargo jetliner at Cayenne’s Félix Eboué Airport following the aircraft’s landing this morning. NASA selected 55 student teams from across the nation to participate in the 2015-2016 NASA Student Launch challenge, to be held April 13-17 near NASA's Marshall Space Flight Center in Huntsville, Alabama. Student Launch is a research-based, experiential exploration activity, requiring an eight-month commitment to design, construct, test, launch and successfully recover a reusable rocket and its scientific or engineering payload. Teams were chosen based on a comprehensive review of their proposal, which outlines their vehicle, its recovery system, payload, safety and educational engagement plans. "Student Launch provides a real-world opportunity for our next generation of engineers and scientists to succeed in aeronautics and aerospace," said Tammy Rowan, manager of Marshall's Academic Affairs Office. "A true hands-on activity, Student Launch pushes their limits in critical thinking, improves their science, technology, engineering and math (STEM) skill-sets and better prepares them for success in tomorrow's workplace." Throughout the process, students will engage in the same tasks and processes currently used by NASA, including a lengthy series of technical reviews mirroring current criteria in NASA's engineering design lifecycle and safety protocols. In addition, student designs must align with current NASA projects, such as the Space Launch System and Mars Ascent Vehicle (MAV). "We are proud to be involved for a second year with Student Launch, helping students succeed in meaningful NASA opportunities," said Centennial Challenges Program Manager Monsi Roman. "MAV and Student Launch align with current NASA research, addressing potential technical issues we may face on our journey to Mars." 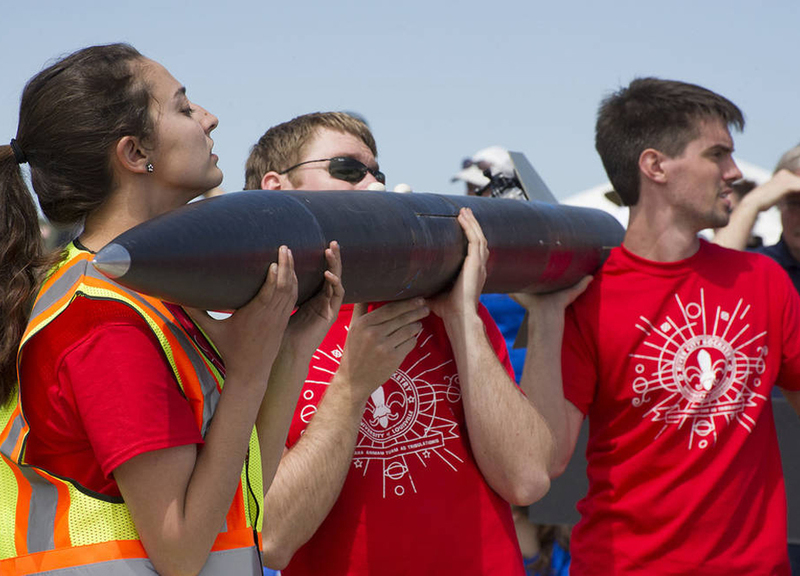 The MAV challenge requires teams to develop an autonomous system to insert a sample container into their rocket, launch and safely recover both the sample and the rocket. 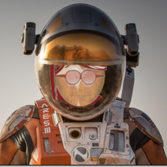 Such innovative technology could be considered for future Mars exploration missions. The Centennial Challenges Office will award up to $50,000 in prize money to the top three teams able to successfully complete this challenge. Student Launch is managed by Marshall's Academic Affairs Office with funding and leadership provided by NASA's Office of Education, NASA's Human Exploration and Operations Mission Directorate and Orbital ATK's Propulsion Systems Division of Promontory, Utah. The Centennial Challenges program is managed at Marshall and is supported by the Space Technology Mission Directorate. The Arabsat-6B and GSAT-15 telecommunications satellites are now in French Guiana - setting the stage for Arianespace's next heavy-lift mission, which is scheduled for an early November liftoff. 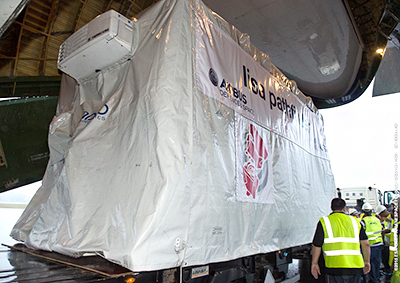 Arabsat-6B was delivered to Felix Eboue International Airport near French Guiana's capital city of Cayenne earlier this month via cargo aircraft. 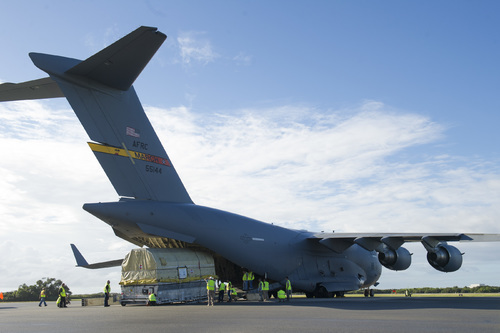 It joins GSAT-15 in French Guiana, which previously was airlifted to the South American country in preparation for Arianespace's sixth Ariane 5 flight of 2015. As part of this familiar step in mission preparations, satellites delivered via cargo jetliner are unloaded at Felix Eboue International Airport then readied for transfer by road to the Spaceport for on-site payload processing, including fit-checks, fueling and integration with launcher. Arabsat-6B is being orbited in the framework of a turnkey contract between Airbus Defence and Space, along with Thales Alenia Space, and operator Arabsat - an Arab League intergovernmental organization. 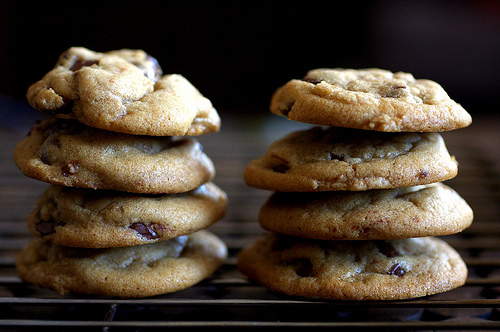 Once operational, the approximately 6,100-kg. relay platform will provide telecommunications and TV broadcasting services for the Middle East and Africa. India's Indian Space Research Organisation national space agency developed the GSAT-15 spacecraft, which will have a mass of some 3,150 kg. and deliver C- and Ku-band telecommunication services. Designated Flight VA227 in Arianespace's numbering system, this November mission will be the 227th with an Ariane series vehicle, as well as the company's 10th overall launch in 2015 across its complete launcher family, which also comprises the lightweight Vega and medium-lift Soyuz. The satellite that weighs 78 kilograms, occupies an orbit lane around the earth's equator at an altitude of 650 kilometers from the earth's surface. The satellite would crisscross Indonesian territory 14 times per day with orbit period of 100 minutes, Thomas said. Indonesia launched its indigenous satellite codenamed Lapan A2 on Monday, using rockets and launching pad in Satish Dhawan Space Center, India, highly expected as a milestone for Indonesia to master satellite technology, an Indonesian senior official said. "The Lapan A2 was originally made by engineers and facilities of Lapan," Head of Indonesia's National Institute of Aeronautics and Space agency (Lapan) Thomas Djamaluddin said on the sidelines of witnessing live broadcast of the satellite launching in his office here. In the future, he said that Indonesia is expected to be capable of producing rockets to support the satellite launching by itself. "So we can launch the satellite independently. We want to develop a satellite technology autonomously," Thomas added. According to Thomas, the satellite would be used to monitor the traffic of vessel, support the efforts to secure maritime security, exploration of fishery natural resources in the country. For vessel monitoring task, the satellite is equipped with Automatic Identification System (AIS) to identify vessels sailing across Indonesian waters. It has surveillance areas of thousands of kilometer squares. The satellite has digital camera and video devices to take images of earth from its orbit. He added that the satellite movement will eventually be controlled by Indonesia's facility located in Rancabungur, Bogor, West Java. Previously in 2007, Indonesia launched the Lapan A1 satellite, now still in its orbit at an altitude of 630 kilometers from earth surface, but its operation period has expired in 2013.
has been delayed to 16 October, 2015, at 4:40 pm EDT....had a crane issue which was repaired on site, causing the delay. During its projected 15-year design life, the satellite will provide telecommunication and direct TV broadcasting services throughout Turkey, as well as in Europe, Central Asia, the Middle East and Africa. Turksat-4B will be operated at 50 degrees east position. 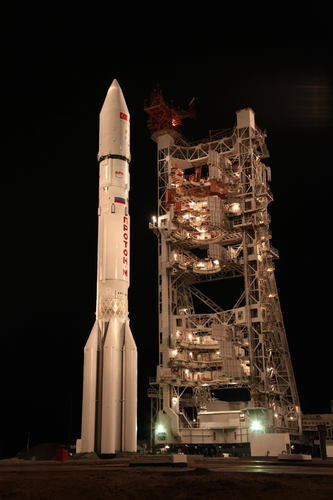 The agreement for the launch of Turksat-4B was announced on April 5, 2011. In February 2014, the launch was planned in November of the same year. 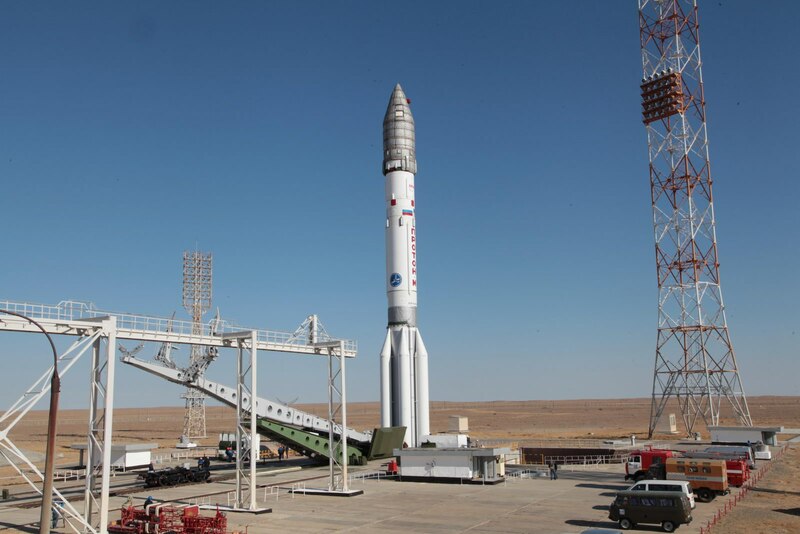 By December 2014, the mission was postponed until June 2015, but that launch date could not be maintained due to the Proton rocket failure with MexSat-1 satellite on May 16, 2015. By the time the Proton successfully returned to flight in August 2015, the launch of Turksat-4B was expected in October. As of mid-September, the mission was scheduled for October 13. 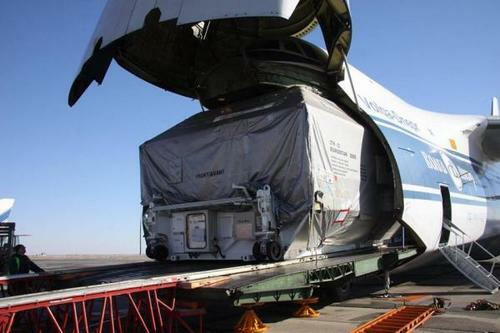 The satellite was delivered to Baikonur on September 2, followed by the Briz-M upper stage on September 16. The assembly of the first, secondand third stages of the rocket was completed in Baikonur on September 18 followed by integrated tests of the launch vehicle. In parallel, a Japanese team of the satellite manufacturer was conducting the fueling of Turksat-4B, GKNPTs Khrunichev announced. At the beginning of October, an overhead crane, which was needed to place the fully assembled payload section onto its transporter, failed, requiring a few days for its repair and re-certification for further operations. As a result, the launch of Turksat-4B was postponed from October 13, 2015, at 23:45 Moscow Time to October 16, 2015, at 23:40 Moscow Time (4:40 p.m. EDT). According to sources in Baikonur, a controller on the crane failed and had to be replaced. Peculiarly, during the Inmarsat-5 F3 launch campaignearlier this year, a processing team working at the Proton facility experienced problems with one of two cranes, which would not come to a smooth stop when running along the length of Building 92A-50. Fortunately at the time, the problem was not serious enough to stop operations. On the night from October 7 to October 8, a fire broke out in the East end section of the residential area of Baikonur. The blaze reportedly originated at a night club next to the Asian market on Gagarin Blvd., local sources said. The Russian Ministry of Emergency Situations, MChS, was quoted as saying that it took until morning on October 8 to extinguish the fire, which had damaged a popular shopping center in Baikonur. 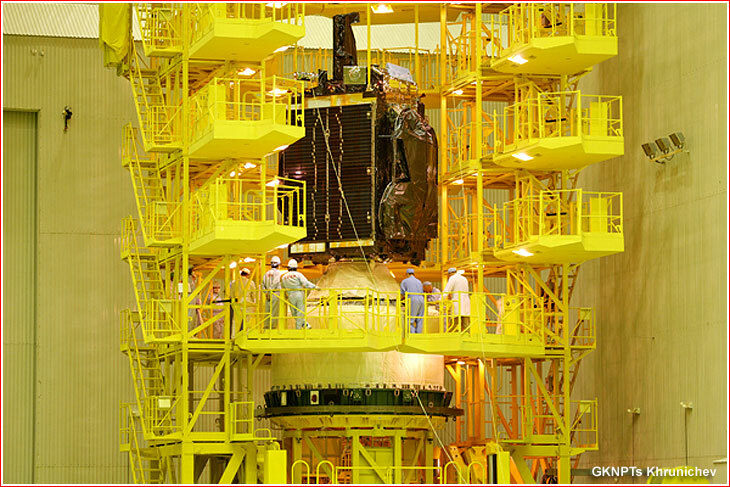 This site has many photo's of the satellite integration to the tug and fairings prior to shipment to payload site crane. 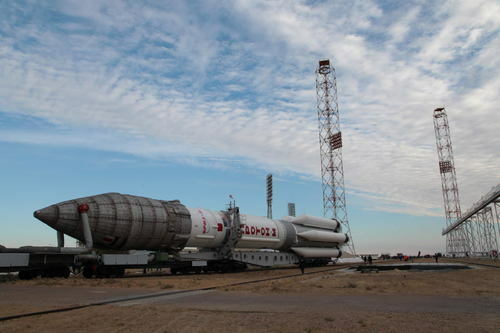 Russian ground crews moved a Proton rocket to its launch pad in Kazakhstan on Tuesday for liftoff with a Japanese-built broadcasting platform for Turkey’s national telecom satellite operator Friday. The 191-foot-tall booster was rotated vertical at the Baikonur Cosmodrome’s Complex 200 launch facility after an early morning rollout by rail car from a nearby assembly hangar. A mobile service gantry was expected to move into place around the rocket to give workers access to the Proton for final prelaunch checks. Liftoff from the arid launch base is scheduled for 2040:11 GMT (4:40:11 p.m. EDT) Friday from pad 39 at Complex 200, beginning a flight of more than nine hours to loft the Turksat 4B communications satellite into an egg-shaped geostationary transfer orbit. The Proton booster’s six RD-276 first stage engines, consuming a mixture of hydrazine and nitrogen tetroxide, will propel the rocket into the stratosphere before separating two minutes after liftoff. A second stage with four engines will fire for three-and-a-half minutes, then yield to a third stage RD-0213 powerplant to guide the rocket’s Breeze M upper stage and Turksat 4B on an initial trajectory just shy of attaining orbital velocity. The Breeze M’s main engine will burn five times to boost the Turksat 4B satellite into a higher orbit closer to its final operating post over the equator. Spacecraft separation is scheduled for 0553 GMT (1:53 a.m. EDT). Produced by Khrunichev State Research and Production Space Center, the Proton/Breeze M vehicle will target deployment of Turksat 4B in an elliptical orbit with a high point of 22,236 miles (35,786 kilometers), a low point of 5,767 miles (9,281 kilometers), and an inclination angle of 13.2 degrees to the equator. 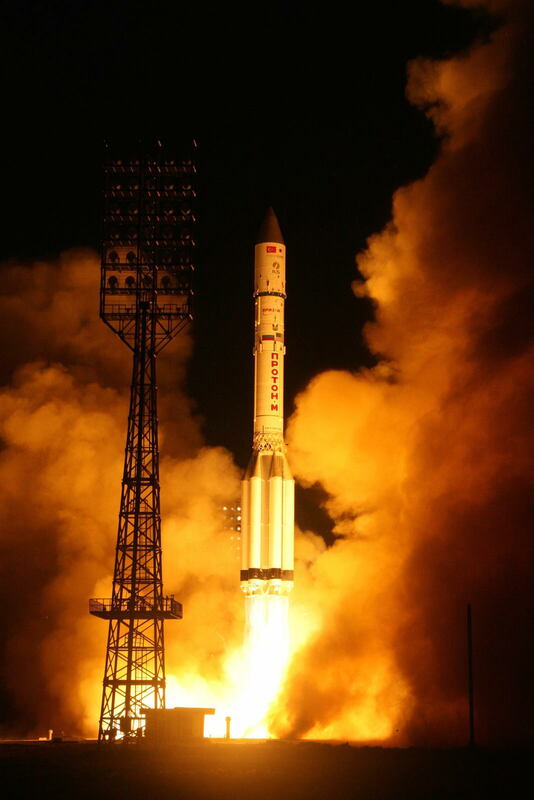 The flight marks the 407th launch of a Proton rocket since its debut in 1965, and the sixth Proton mission of 2015. It will be the 91st Proton launch for a commercial customer under the auspices of International Launch Services, a Virginia-based company which manages Proton sales in the global market. Built by Mitsubishi Electric Corp., the Turksat 4B satellite is designed for a 15-year service life, according to Turksat AS, the craft’s operator. The Proton/Breeze M will aim to deploy it in an orbit close enough to its final operating position to give the satellite 30 years of fuel life, ILS officials said. The satellite, which weighs 5.4 tons (4,924 kilograms) with its fuel tanks full, will use its own propulsion system to reach a circular geostationary orbit over the equator a couple of weeks after launch. Ground controllers will park the satellite at 50 degrees east longitude, where its payload will broadcast television, connect Internet and data networks, and beam other services across Europe, the Middle East, Africa and Central Asia. Its coverage zone extends from England to China, according to Turksat. Turksat 4B will join a similar communications craft named Turksat 4A launched in February 2014. It was supposed to launch in late 2014, but was delayed after a pair of Proton launch failures grounded the rocket’s manifest of commercial and Russian government missions. Friday’s mission will be the Proton’s third launch since returning to flight after its last crash in May. 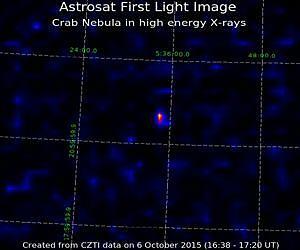 Image of Crab Nebula in hard X-rays above 25 keV. The bright spot near the center indicates Crab. Image courtesy TIFR. India's Astrosat spacecraft, the country's first space observatory that was launched into orbit on Sept. 28, is in good shape and has already started performing science operations, according to a scientist involved in the mission. "It is in good shape and in stable communication with the ground stations in and near Bengaluru," K.P. Singh of the Tata Institute of Fundamental Research (TIFR) in Mumbai, India, told astrowatch.net. The science data gathered by Astrosat are sent to the ground station at the Indian Space Research Organisation's (ISRO) Mission Operations Complex (MOX) in the city of Bengaluru. The data is then processed, archived and distributed by the Indian Space Science Data Centre (ISSDC) located at Byalalu, near Bengaluru. 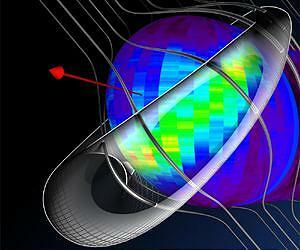 Singh is responsible for the Soft-Xray Imaging Telescope (SXT) onboard Astrosat. He believes that this instrument will provide new insights into our understanding of the universe as SXT is designed for studying the X-ray spectrum, coming from distant celestial bodies. The telescope employs focusing optics and a deep depletion CCD camera at the focal plane to perform X-ray imaging in the 0.3-8.0 keV band. "The simultaneous multi wavelength observations from visible to hard X-rays, combined with large X-ray bandwidth is expected to lead to new insights on the physics of matter being accreted around black holes, neutron stars and white dwarfs. "The outflowing matter in the form of jets from supermassive black holes is believed to be present in the centers of very active galaxies, and the magnetic field of neutrons stars," Singh revealed. 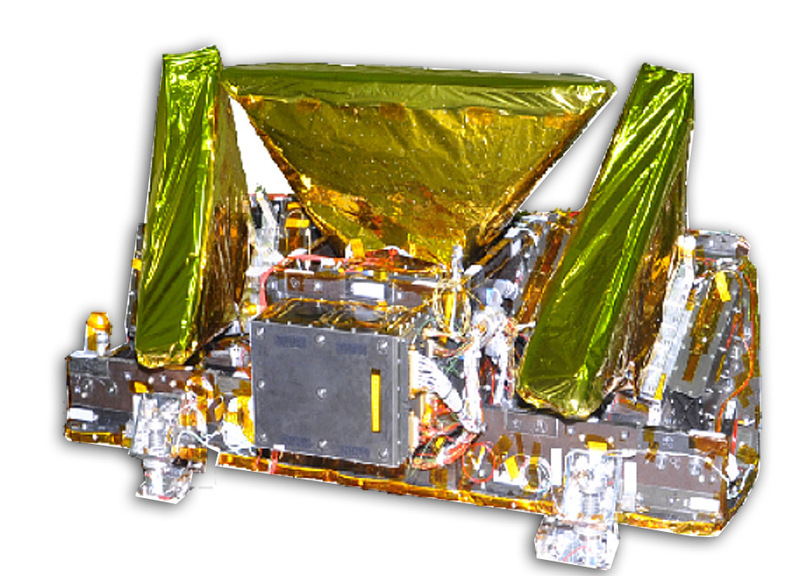 Astrosat is India's first dedicated multi wavelength space observatory. 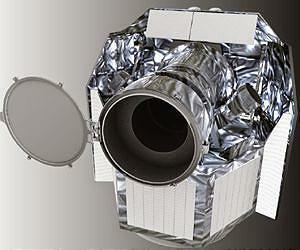 The spacecraft is designed to observe the universe in the visible, ultraviolet (UV), low and high energy X-ray regions of the electromagnetic spectrum simultaneously with the help of its six payloads: SXT, Ultraviolet Imaging Telescope (UVIT), Large Area X-ray Proportional Counter (LAXPC), Cadmium Zinc Telluride Imager (CZTI) Scanning Sky Monitor (SSM) and Charged Particle Monitor (CPM). According to ISRO, all scientific instruments are working fine, science operations are carried out regularly and the spacecraft's health is normal. Astrosat, weighing about 1.5 tons, has been put into a targeted low Earth orbit (LEO) at an altitude of 404 miles (650 km) when it will continue its mission for five years. This orbit will enable observing supernova remnants, quasars, pulsars, galaxy clusters and active galactic nuclei at a number of different wavelengths simultaneously. The Astrosat mission is a humongous effort of ISRO and all major astronomy institutions throughout the country, including TIFR, Inter University Centre for Astronomy and Astrophysics (IUCAA) of Pune, Indian Institute of Astrophysics (IIAP) and Raman Research Institute (RRI) of Bangaluru as well as some of the universities in India and two institutions from Canada and the UK. Thanks to the successful launch of Astrosat, India became the fourth country to have its own space observatory. Singh hopes that the spacecraft would exceed expectations by offering even better images than the other space observatories could currently provide. "The pictures in UV are expected be a little better than those obtained from NASA's GALEX [Galaxy Evolution Explorer], and will also have many more spectral bands in UV. In X-rays these are expected to be at best comparable to that of Suzaku [Japan's X-ray astronomy observatory] in soft X-rays, and [NASA's] Swift's BAT [Burst Alert Telescope] in hard X-rays," Singh said. He also revealed that ISRO is planning another space observatories that would be developed together with the scientific community. The agency eyes smaller individual payloads that will be focused on a particular topic. Singh added that missions like Astrosat should drive the nation's space industry to achieve good quality and precision in manufacturing, and strengthen the bonds between industry and scientists. The final U.S. Air Force Global Positioning System (GPS) Block 2F satellite in a fleet of 12 has been delivered to Cape Canaveral Air Force Station in Florida for final processing and preparation for launch. The GPS IIF-12 satellite was flown from Boeing’s Satellite Development Center in El Segundo, California, on Oct. 8 aboard an Air Force C-17 Globemaster III aircraft. The 3,600 pound satellite (launch weight) will undergo a series of checks and rehearsals, including functional checkout, compatibility testing, battery installation, fueling and mating to a payload adapter before being hoisted 200 feet atop a United Launch Alliance (ULA) Atlas-V 401 booster for launch NET (No Earlier Than) Feb. 2016. BENGALURU: Indian Space Research Organisation (Isro) has postponed the test launch of the key reusable launch vehicle technology demonstrator (RLVTD) to next year. 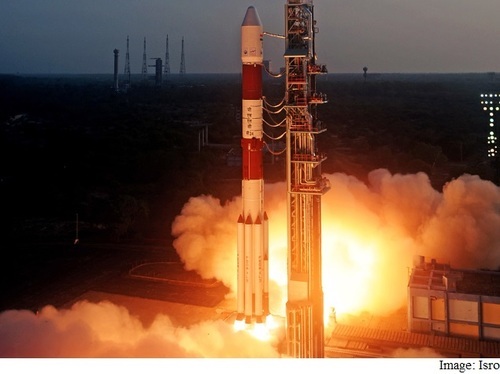 While the earlier test schedule of September was disrupted by the launch of Astrosat, India's first astronomy satellite other launches with societal application have delayed it further. A source said the focus currently is on putting the payload for GPS Aided Geo Augmented Navigation (GAGAN) system which will be put in space by GSAT in November first week and the subsequent Indian Regional Navigation Satellite System (IRNSS) launch in December. "Both these missions have direct societal applications, which Isro feels is important," the source said, reiterating that preparations for the RLVTD test were all ready. The reusable launch vehicle will reduce launching cost to one-tenth of what's incurred now. Another source pointed out that even the eventual test of the RLVTD will be of a vehicle that's one fifth the original prototype and may not even require the PSLV. "A single-phase rocket will suffice," he said. Isro has already successfully completed testing the crew module, which is important for the human space programme. Hey, DocM likes this Topic too. We get to read about the-not-so-publicized missions. WASHINGTON — An experimental NASA cubesat launched Oct. 8 has an attitude control problem that is preventing its laser communications payload from being tested, the agency said Oct. 13. In a brief statement, NASA said the Optical Communications and Sensor Demonstration (OCSD) spacecraft, known as OCSD-A or AeroCube-7A, suffered an unspecified problem with its attitude control system. While the spacecraft is in contact with ground controllers by radio, “the attitude control system must function properly in order to demonstrate the optical communications system,” NASA said. OCSD-A, a joint project of NASA and the Aerospace Corp., launched as a secondary payload on an Atlas 5 rocket from Vandenberg Air Force Base, California. The spacecraft was one of 13 cubesats sponsored by NASA and the National Reconnaissance Office that flew along with the primary payload, a classified mission for the NRO. The Aerospace Corp. built the satellite, funded by NASA’s Small Satellite Technology Program, to demonstrate the ability to use lasers on very small spacecraft to provide communications at high data rates. The satellite is a 1.5-unit cubesat, measuring 10 by 10 by 15 centimeters, outfitted with a laser capable of transmitting data at rates of 5 to 50 megabits per second to telescopes on the ground. OCSD-A is designed primarily to test both the laser and an attitude control system in lieu of more traditional ground testing. “Cubesats are relatively inexpensive, and you have a number of launch opportunities each year, so you can actually think about flying something rather than doing extensive ground testing,” Siegfried Janson of the Aerospace Corp. said in an Aug. 11 presentation about the mission during the Conference on Small Satellites at Utah State University. NASA plans to follow OCSD-A with two similar cubesats, known as OCSD-B and -C or AeroCube-7B and -7C. Those satellites, scheduled for launch in early 2016, will test laser communications at even higher data rates, as well as proximity operations near each other. Those satellites will use a simplified version of the laser flown on OCSD-A, as well as a new thruster system that uses steam for propulsion. 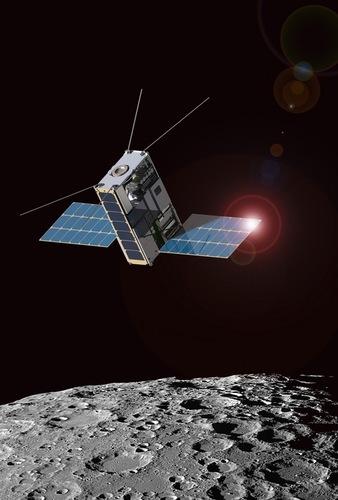 NASA has approved a mission called Lunar IceCube, which will send a 6U cubesat to hunt for water ice on the moon. The contracts stipulate that each of these companies will launch 132 lbs. 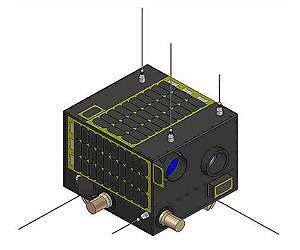 (60 kilograms) of cubesats to low Earth orbit by April 2018. The goal of these three launches is to demonstrate rocket technology that will get cubesats off the ground cheaply and efficiently, on trajectories designed just for them, for years to come. "It's a huge step for the commercialization of space," Mark Wiese, chief of the Flight Projects Office for NASA's Launch Services Program, which is based at Kennedy Space Center in Florida, said during a news conference today (Oct. 14). "We're excited for the competition," Wiese added. "I can only begin to imagine the opportunities that these companies will open up for you, your children and the world." The basic building block of cubesats is a cube measuring just 4 inches (10 centimeters) on each side. Satellites that are the equivalent of three such cubes put together are known as 3U cubesats; 6U spacecraft integrate six cubes, and so on. Thanks to recent advances in computer and electronics technology, a lot of capability can be crammed into such tiny, low-cost packages. San Francisco-based Planet Labs, for example, has launched dozens of 3U spacecraft called "Doves" to provide high-resolution imagery of Earth, and NASA plans to launch cubesat missions to the moon and a near-Earth asteroid on the first flight of the agency's Space Launch System megarocket in 2018. Furthermore, two 6U cubesats will fly to Mars in 2016 to help provide communications during the entry, descent and landing of NASA's InSight lander. Low-cost, dedicated cubesat launchers should further increase the scientific reach and effectiveness of small spacecraft, NASA officials said. "Today's cubesat technology fosters hands-on engineering and flight research training," Michael Freilich, director of NASA's Earth Science Division, said in a statement. 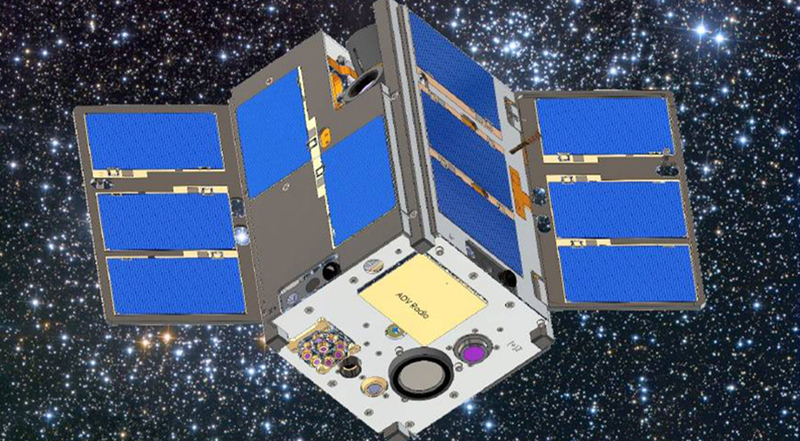 "With the addition of reliable, affordable and dedicated access to space on small launchers, constellations of smallsats and cubesats could revolutionize our science-based spaceborne Earth-observing systems and capabilities." The three companies that got VCLS contracts have not yet flown commercial missions with their launch vehicles, but all three are making progress toward that goal. For example, Firefly Space Systems, which is developing a rocket called Alpha, recently conducted a successful engine test on the ground. When Alpha is up and running, it will launch small payloads to orbit for $8 million per liftoff, company representatives said. Virgin Galactic also performed an engine ground test recently for itsLauncherOne rocket, which will blast off from an altitude of 50,000 feet (15,000 meters) after being dropped by a carrier aircraft. (Virgin's tourist-carrying suborbital space plane, SpaceShipTwo, will be similarly air-launched.) 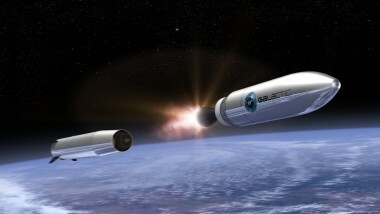 LauncherOne liftoffs will cost less than $10 million apiece, according to Virgin Galactic representatives. 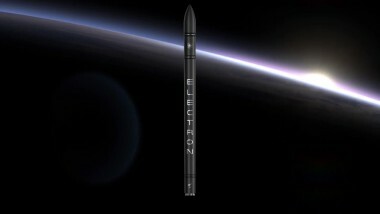 Meanwhile, representatives of Rocket Lab, which recently signed a contract to launch Moon Express' private lander toward the moon in 2017, say the first flight of the company's Electron rocket should come in early 2016. Electron launches currently sell for $4.9 million each. Firefly and Virgin Galactic got VCLS contracts worth less than their companies' stated price per launch because of the risks involved in these missions, Wiese said. "We are buying a demonstration mission, so we know we're one of the first flights of these companies," he said. "Obviously, [there's] more risk on a first flight, so there's potentially a discount there — a chance for us to get in early as an early customer." The Electron, on the other hand, will be fully commercial when it lifts off on its VCLS mission, Rocket Lab CEO and founder Peter Beck said. "Our price is a little bit higher based on the extra requirements that are involved for the NASA mission over a standard, basic commercial mission," Beck said during today's news conference. The payloads for the three flights under the VCLS contracts have not yet been assigned, NASA officials said. 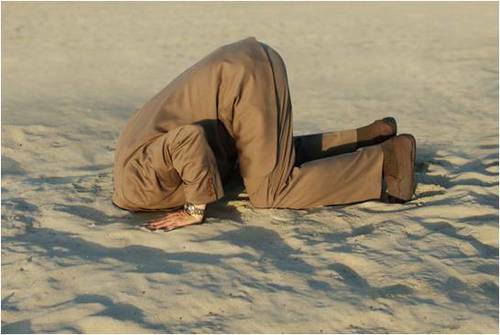 I know this next article might sound silly...but, some people actually believe no one put a foot on the moon......."facepalm" time for them. Vitaly Yegorov, a public relations official for a Russian space startup by day and a popular space journalist by night, launched crowdfunding campaign last weed aimed at building a low-cost lunar orbiter. Last time we checked, the effort had already raised more than 1.1 million rubles (~$18,000), far exceeding its goal. This remarkable result was helped by the proclaimed goal of the nascent lunar project: to beam back high-resolution images of historic landers and even footprints left on the dusty lunar surface, and thus debunk once and for all the claim that NASA astronauts never landed on the Moon and that the famous scenes of men saluting the American flag were staged somewhere in Hollywood. Perhaps it shouldn't be surprising given the chilly nature of US-Russian relations these days. But now, nearly a half-century after Apollo astronauts walked on the lunar surface, the moon hoax theory is especially popular in Russia. According to a 2011 poll, around 40 percent of Russian citizens believe that the Americans never set foot on the Moon. Yegorov doesn't hide the fact that while his main goal is to jump-start the Russian planetary exploration program, which saw its last unmanned probe head to the Moon in 1976, he wasn't afraid to use the moon hoax theory as a PR stunt to attract funding and attention. "I would be very interested to explore the Moon and do science, but (the moon hoax theory) is certainly the hottest topic right now," Yegorov told Popular Mechanics. And now ArianeSpace wants into the smallsat market. 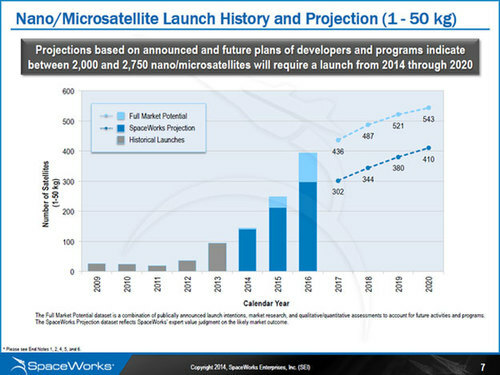 Seems the SpaceX and OneWeb constellations, Firefly, RocketLabs Electron, VG's LauncherOne etc. got their attention. Funny because not long ago they blew off the need for small birds and launchers. Funny thing about paradigm shifts, they often pull the rug out from under old space's preconceived notions. This one caught me off guard. ArianeSpace had treated re-useability as something that they will look at later...treating it as a "fad"....and now this. Look's like someone shook the "blockhead's" tree fort! LAS CRUCES, N.M. — Virgin Galactic is planning to return to a rubber-like fuel when it resumes powered test flights of its SpaceShipTwo suborbital vehicle based on the results of an ongoing series of tests of the spacecraft’s hybrid rocket motor. Virgin Galactic Chief Executive George Whitesides, speaking at the International Symposium for Personal and Commercial Spaceflight here Oct. 8, said the company had carried out a series of full-duration test firings of the motor recently, which used a rubber-like fuel formally known as hydroxyl-terminated polybutadiene (HTPB). Virgin Galactic originally planned to use HTPB fuel for the rocket motor, which also uses liquid nitrous oxide propellant. However, in May 2014, the company announced it was switching to a polyamide fuel, similar to nylon, citing improved performance. That nylon-fuel motor was flown on SpaceShipTwo’s last test flight in October 2014, when the vehicle broke apart seconds after engine ignition. An investigation led by the National Transportation Safety Board concluded in July that pilot error in prematurely unlocking the vehicle’s feathering system caused the crash, and the motor was not implicated in the accident. Whitesides did not state at the conference if the rubber or nylon fuel would be used when powered test flights of a second SpaceShipTwo vehicle resumed. However, another company executive, Will Pomerantz, said earlier this year that the company had an “internal horse race” between the two motors, and would fly the one that is the best. In an Oct. 14 email, Whitesides said that the current design of the rocket motor “baselines” the use of HTPB fuel, a decision that will be finalized after a series of qualification, or “qual,” tests. “We’re focused on qual of that system now, and assuming qual is completed according to plan, we will use that configuration to resume powered test flights,” he wrote. 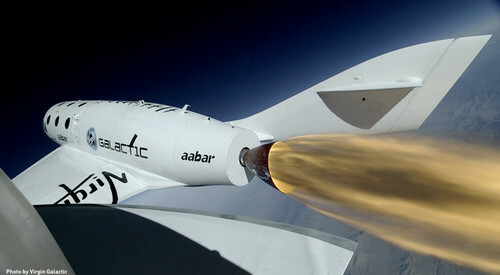 Whitesides said at the conference that Virgin Galactic was making progress completing the second SpaceShipTwo vehicle. Recent milestones in the vehicle’s development included a fit check of the oxidizer tank for its propulsion system inside the vehicle and new seats for the pilots in the cabin. The second SpaceShipTwo will go through a test program similar to the first, including a series of “captive carry” flights where it remains attached to its WhiteKnightTwo aircraft, unpowered glide flights, and powered tests. However, there may be fewer test flights, Whitesides said, based on the experience from the original test program. The proposed design for CHEOPS is based on the AstroBus family of satellite platforms, and uses the AstroBus-S model. Other missions based on the AstroBus series include SPOT 6 and 7, KazEOSat-1, the Sentinel-5 Precursor, PeruSat-1 and the MetOp Second Generation satellites. Airbus Defence and Space has finished building the structural model for ESA's CHEOPS (CHaracterising ExOPlanet Satellite), Europe's first mission to search for exoplanetary transits by performing ultra-high precision photometry on bright stars already known to host planets. Airbus Defence and Space, as prime contractor of CHEOPS, is preparing the first spacecraft test campaign in Spain. The structure of the platform has been fitted with mass dummies to represent the different equipment of the satellite, and the thermomechanical model of the instrument has also been integrated. The structural model will now undergo mechanical qualification through the end of the year. Once it is qualified, the structure will later be used as flight model. Work is progressing rapidly according to schedule and Airbus Defence and Space teams in Spain are working hard to meet the demanding deadline since CHEOPS is ESA's first small-class mission, to be launch-ready in December 2017. The satellite consists of a Ritchey-Chretien telescope integrated in a standard small platform. Over three and a half years, from its dedicated low-Earth orbit, it will observe bright and nearby stars that are known to have a planetary system. One of the main objectives of CHEOPS is to determine the radii of planets with masses that are already known as a result of studies using ground-based observatories. This will then allow deductions to be made as to their size and density in order to classify them as rocky, gas or other types of planets. CHEOPS was selected in October 2012 from among 26 scientific proposals and has an estimated cost of euro 50 million for the complete mission. NASA has announced the continuation of a two-phase $750,000 research award to Embry-Riddle Aeronautical University and project partner Honeybee Robotics to develop a small integrated autonomous robotic spacecraft system to support the exploration and mining of asteroids and other planetary bodies and moons. Dr. Hever Moncayo and Dr. Richard Prazenica, both Assistant Professors of Aerospace Engineering in the College of Engineering are leading the effort at the Daytona Beach Campus. Also collaborating on this project is Dr. Sergey Drakunov, Professor of Engineering Physics in the Physical Sciences Department and Associate Dean of the College of Arts and Sciences. Dr. Kris Zacny is the team lead for Honeybee Robotics. The Embry-Riddle team includes Aerospace Engineering master’s degree students Diego Garcia, Chirag Jain, Andres Chavez, Wai Leuk Law, Aerospace Engineering Ph.D. student Andres Perez and Engineering Physics Ph.D. student Samuel Kitchen-McKinley. The researchers are focusing on an innovative concept based on autonomous small free-flyer prospector spacecraft that can leave from, return and recharge from a mothership on the planet’s or asteroid’s surface. The spacecraft design will use unique technologies such as MicroDrills and Pneumatic Samplers previously developed under NASA Small Business Innovation Research project awards by Honeybee Robotics. In particular, the research effort will focus on flight control and guidance under extreme environments, vision-aided navigation approaches, and sampling systems design, testing and evaluation. 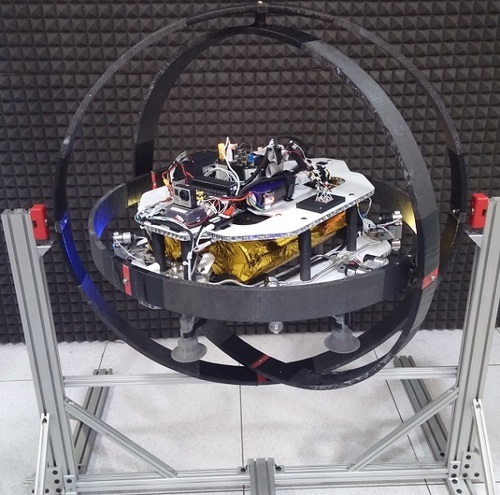 The proposed flying scouts spacecraft system was developed, simulated and evaluated during Phase I of the project, and is now being experimentally validated and demonstrated during Phase II through flight-testing on an autonomous research platform. For more information on developing deep space flying prospecting robots, see Extreme Access Flyer to Take Planetary Exploration Airborne on the NASA website. Embry-Riddle Aeronautical University, the world’s largest, fully accredited university specializing in aviation and aerospace, is a nonprofit, independent institution offering more than 75 baccalaureate, master’s and Ph.D. degree programs in its colleges of Arts & Sciences, Aviation, Business, Engineering and Security & Intelligence. Embry-Riddle educates students at residential campuses in Daytona Beach, Fla., and Prescott, Ariz., through the Worldwide Campus with more than 125 locations in the United States, Europe, Asia and the Middle East, and through online programs. The university is a major research center, seeking solutions to real-world problems in partnership with the aerospace industry, other universities and government agencies. For more information, visit http://www.embryriddle.edu, follow us on Twitter (@EmbryRiddle) and facebook.com/EmbryRiddleUniversity, and find expert videos at YouTube.com/EmbryRiddleUniv. Saft, the world’s leading designer and manufacturer of high technology batteries for industry, has been awarded a Long Term Agreement (LTA) with The Boeing Company (Boeing) to supply lithium-ion (Li-ion) batteries for its telecommunication satellites. The five-year agreement, executed in follow-up to a 2009 LTA, allows Saft to provide a steady and reliable supply of Li-ion batteries to meet the rigorous demands of the space environment, powering Boeing’s satellites when solar rays are blocked by the earth and supporting the entire geosynchronous orbit (GEO) mission duration. Additionally, the lightweight Boeing battery design using Saft’s Li-ion cells allows for a lighter overall satellite, resulting in significant launch cost savings for Boeing and other spacecraft manufacturers. 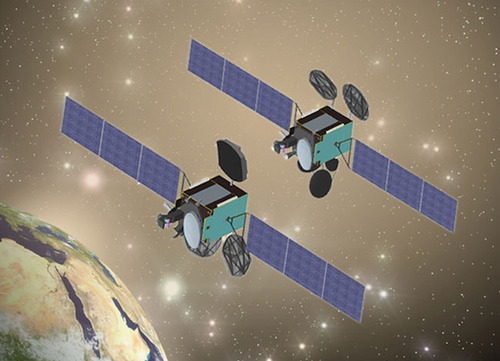 With more than 50 years of experience in the space market, Saft’s Li-ion technology and solutions have long been used to withstand extremely demanding missions with GEO and medium earth orbit (MEO) global positioning satellites, and to support specific applications such as high power telecommunications to observation and defense low earth orbit (LEO) satellites. No surprise here...But...In 5 years time, we will be able to see how "non precious metal" battery and storage medium technology, has progressed, and to watch for experimental progression. According to a SpaceWorks study published in 2014, over 2000 nano/micro-satellites under 50 kg will need to be launched by 2020. 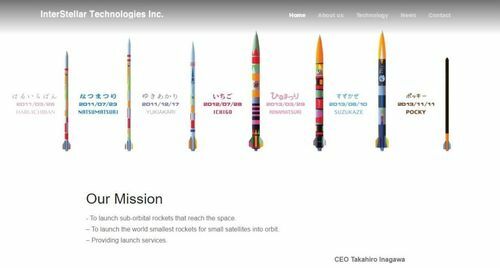 Several of the companies interested in fulfilling that need presented their ideas at the International Astronautical Congress in Israel, including Zero 2 Infinity launching its new SmallSat launcher called Bloostar. Other notable presentations at a Thursday afternoon session titled Small Launchers: Concepts and Operations were by Virgin Galactic, Dynetics and Interstellar Technologies Inc. They aren't the only companies interested in this growing market. There's also Firefly Space Systems, Rocket Labs, Generation Orbit and CubeCab. The one commonality between all the companies? None have yet to launch and most are still looking for funding to complete development of their launchers. Virgin Galactic's presentation didn't include any new information, but at a SmallSat plenary held the day before, they did release the news that they would be launching two Planet Labstechnology demonstration nanosats. Dynetics, unlike its competitors in this field, is an experienced company having worked on many space projects over the years including NASA's current Space Launch System. 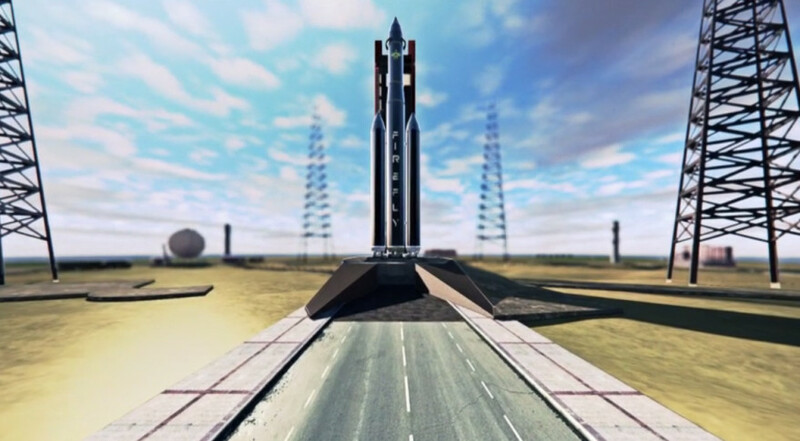 They're attempting to develop a mobile satellite launcher for payloads up to 25 kilograms. While they've made progress on their launcher engine, they still need about $40 million to complete development of the system, including first launch, according to Steve Cook, Vice President of Corporate Development. Interstellar Technologies Inc from Japan is a two year old startup that was initial funded from a student association and has completed two attitude control tests. Their goal is to develop the "worlds smallest launcher" for 50 kg payloads at a cost of $2.5 million. They too are looking for funding to move forward. After the session concluded Zero 2 Infinity held a press conference to formally introduce Bloostar. Bloostar is a three-stage rocket launched from a balloon which releases it at about 20 km altitude. The balloon will be launched near the Canary Islands from a boat. According to Jose Mariano Lopez-Urdiales, their CEO, this is an ideal location as the winds are stable for launching balloons. He also cited substantial cost-savings from not having to pay for a range. Bloostar can carry payloads up to of 150 kg and can be configured to carry multiple smallsats on each launch. The cost at this time is $4 million per launch, though a bulk buy will get the customer a discount. Zero 2 Infinity says they have seven letters of intent from potential customers and have several investors already from their previous projects. Bloostar faces several technical issues launching from a balloon. This includes; how will they make sure the rocket launches in the right direction and how to deal with propellant boil off as the balloon floats up to launch altitude. They had the answers to these and other questions posed to them and are confident that their models say the system will work. JERUSALEM — China’s launch-vehicle manufacturer, frustrated with a longstanding U.S. government ban on the export of U.S.-built satellite parts to China, is designing a rocket that would be exported in an attempt to escape the law’s reach. The China Academy of Launch Vehicle Technology (CALT) said it had started negotiations with authorities in Indonesia, Sweden and Tanzania about hosting the Naga-L rocket, designed to appeal to owners of small satellites headed to low Earth orbit. It was not clear how advanced these discussions are. In the case of the Esrange facility in northern Sweden, now used to launch stratospheric balloons and suborbital sounding rockets, any orbital launch capability likely would be closely scrutinized by neighboring Norway and Finland. The two-stage Naga-L, based on components used for heavier-lift versions of China’s Long March rocket family, will be capable of placing a 600-kilogram satellite into an 800-kilometer polar low Earth orbit, without using an orbit-raising stage, when launched from Indonesia, CALT’s Haoliang Yang said here Oct. 14 during the 66th International Astronautical Congress. The rocket’s basic version will be priced at $10 million per launch, Yang said. For the past 15 years, the U.S. government has banned the export to China of U.S.-built satellites and satellite components, using the International Traffic in Arms Regulations (ITAR) as the enforcement mechanism. The ban was originally designed as an attempt to slow development of China’s missile technology by crippling its rocket-launch program. Human-rights issues in China have also been used as an argument for maintaining the prohibition, first instituted in 1999. The ban has not stopped development of China’s Long March vehicles. Two new versions have been introduced this year and China’s 2015-2025 space development plan foresees 100 launches during that period, just for China’s domestic demand. With U.S. parts embedded in most telecommunications satellites, the prohibition has, for the most part, kept China out of the global commercial launch market except for nations that have elected to purchase a Chinese-built satellite along with a Long March rocket. Unable to import satellites, China now wants to export a rocket. “We can export this vehicle to get around the ITAR regulations,” Yang said. “It would only be for commercial launches.” A first launch of the two-stage Naga-L, from China, is planned in 2017, he said. JERUSALEM — Israel Aerospace Industries, in its first satellite export contract, has sold a high-resolution optical imaging spacecraft to an unnamed government, IAI officials said. Sharpening its export focus, Tel Aviv-based IAI is also introducing an all-electric version of its Amos telecommunications satellite line, Amos-E, which the company said is aimed at a market of customers needing 10-20 transponders to maintain an orbital slot. Amos-E, which IAI Space Division General Manager Opher Doron said could be built in three years, is already being bid in one of several satellite competitions IAI has entered with the assistance of Israel’s export-credit agency, ASHRA. In an interview here during the 66th International Astronautical Congress, Doron and IAI Chief Executive Joseph Weiss said that while ASHRA, the Israel Foreign Trade Risks Insurance Corp. Ltd., is new to the satellite world, it is now fully behind IAI’s satellite export efforts. “They understand the business now and they are being a real help to us” for both Earth observation and telecommunications satellite exports, Weiss said. Several companies are building all-electric satellites, which offer up to 50-percent weight savings over conventional chemical propellant, allowing customers to add more payload or use the weight savings to secure a less-expensive launch service. Amos-E employs the same electric-propulsion system used on Amos-6, scheduled for launch in mid-2016 aboard a SpaceX Falcon 9 Upgrade rocket. But Amos-6 uses chemical propulsion to climb into geostationary orbit position. Then its electric propulsion takes over and maintains the satellite stably in orbit for its 15-year service life. Amos-E uses electric-propulsion units built by Fakel of Russia for both orbit-raising and satellite station-keeping. Doron said competitors such as OHB SE of Germany, SSTL of Britain and Orbital ATK of Dulles, Virginia, provide small telecommunications platforms, few are able to offer 4 kilowatts of payload power and 10-20 transponders on a satellite weighing 1,500-2,000 kilograms. Boeing Space and Intelligence Systems of El Segundo, California, built the first all-electric satellites outside of Russia. Both have arrived in geostationary orbit and are operating for their owners, Eutelsat of Paris and ABS of Bermuda. The ABS-3A satellite weighed 1,954 kilograms at launch and delivers 7.5 kilowatts of power to the payload. Doron conceded that IAI, with a history of building no more than one telecommunications satellite every three years, does not have the business scale to match the prices the competition. But with the help of a cost-sharing program with the Israel Space Agency, he said IAI has been able to shave cost from Amos-E. In Earth observation, IAI has been building radar and optical satellites for years for the Israeli government. The satellites are known for their high resolution and, especially, their low weight. The Optsat 3000 optical Earth observation satellite being built for the Italian Defense Ministry as part of a trade involving Italian jet trainer aircraft has a 38-centimeter resolution from a 450-kilometer orbit, with an 11-kilometer swath, and weighs 380 kilograms. IAI’s Tecsar line of radar observation satellites now feature 1-meter resolution from 500 kilometers, a 5-kilometer swath and weighs less than 350 kilograms. Doron and Weiss both confirmed that IAI is building an Optsat 3000-class satellite for the defense ministry of an unnamed government. It is also building another optical reconnaissance satellite for the Israeli government, and the Eros-C 38-centimeter-resolution satellite for IAI’s Imagesat subsidiary that sells geospatial imagery globally. “Do you know anyone else who is building four satellites at the same time in the high-resolution Earth observation business?” Doron asked. In fact Airbus Defence and Space and Thales Alenia Space are under contract to build four high-resolution optical satellites, two each for the governments of Morocco and the United Arab Emirates, although whether actual hardware construction has started is uncertain. 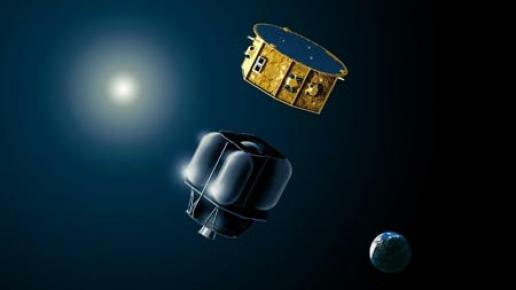 The two companies are also building two optical reconnaissance satellites for the French Defense Ministry. Doron said the Israeli government recently followed the U.S. government in allowing sharper imagery to be sold commercially. The limit is now set at a 30-centimeter ground sampling distance. IAI lost a Peruvian government optical imaging satellite contract to Airbus but is bidding on several current and expected competitions. “You want to know where I am looking to sell satellites?” Doron said. “Just look at where Airbus has already sold satellites. Nations that have issued or are expected to issue bid requests for imaging satellites, optical or radar, include Chile, Thailand and Poland. South Korea has expressed interest in a radar observation satellite and if a formal bid is issued, IAI is likely to bid against Airbus of Germany, OHB SE of Germany and Thales Alenia Space of Italy. One could say that SpaceX, Blue and other NewSpace'ers are the sharp point of a very large spear. Sooner or later outfits like Firefly will move up to medium and heavy launchers as well, forcing yet another round of innovation. A Russian Proton rocket boosted a Turkish telecommunications satellite into space Friday after a blazing liftoff from Kazakhstan, but it was expected to take more than nine hours to inject the 5.4-ton broadcasting craft into an orbit ranging more than 20,000 miles above Earth. 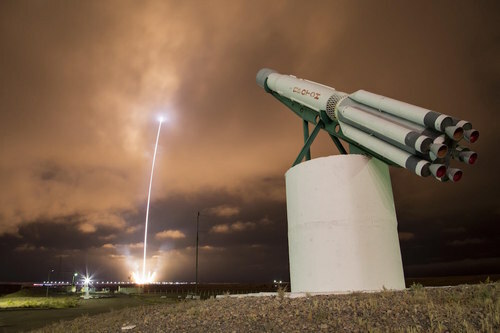 The Turksat 4B satellite — encapsulated in the nose cone of the 19-story Proton booster — blasted off at 2040:11 GMT (4:40:11 p.m. EDT) Friday from the Baikonur Cosmodrome, riding a column of orange rocket exhaust through low clouds hanging above the arid space center. After pitching on a northeast trajectory from Baikonur, the Proton rocketed through the speed of sound and shed its six-engine first stage in the first two minutes of the flight. The Proton’s second and third stage engines, all burning a noxious mixture of hydrazine and nitrogen tetroxide propellants, completed their programmed firings within 10 minutes, then deployed a battery-powered Breeze M space tug to guide Turksat 4B to its proper position in space. An initial burn by the Breeze M’s main engine stabilized the spacecraft in a low-altitude parking orbit, and four more firings were planned to raise Turksat 4B’s altitude and move its orbit closer to the equator. After the Breeze M’s fifth burn, the upper stage is scheduled to release Turksat 4B at 0553 GMT (1:53 a.m. EDT) Saturday. The mission’s target orbit numbers were published by International Launch Services, the Proton’s U.S.-based marketing and sales firm. Turksat 4B’s on-board propulsion system will circularize its orbit 22,300 miles over the equator. The satellite’s owner, Turksat AS of Ankara, Turkey, said the spacecraft will complete orbital tests and be commissioned in December. Based on the DS2000 satellite platform made in Japan by Mitsubishi Electric Corp., Turksat 4B is designed for a 15-year service life. With an on-target orbit following Friday’s launch, engineers expect the satellite will have enough fuel reserves to operate 30 years. Turksat ordered two satellites from Melco in 2011, and the first of the pair — Turksat 4A — successfully launched on a Proton rocket in February 2014. “We have been working on this satellite project over the last three years to get reliable, high-quality and enhanced performance products in order to provide servces for our end customers,” said Taha Tetik, Turksat’s program manager for the Turksat 4A and 4B missions. Turksat 4B’s payload covers the Ka-band, Ku-band and C-band spectrum. The Ka-band payload will support high-speed Internet services, adding 3 gigabits per second of capacity to Turksat’s network, according to a statement on the company’s website. The Ku-band transponders will broadcast television programming. From a final operating post in geosynchronous orbit at 50 degrees east longitude, Turksat 4B will reach a coverage zone spanning from Europe to Afghanistan, including Turkey, the Middle East and Africa. Yasunori Kamochi, general manager of Melco’s space systems division, said the Turksat 4B spacecraft will reach geosynchronous orbit six days after launch, then will be handed over to Turksat after the end of in-orbit testing. The satellite’s solar panels and antenna reflectors will also be unfurled. Friday’s flight marked the 407th launch of a Proton rocket since its debut in 1965, and the sixth Proton mission of 2015. 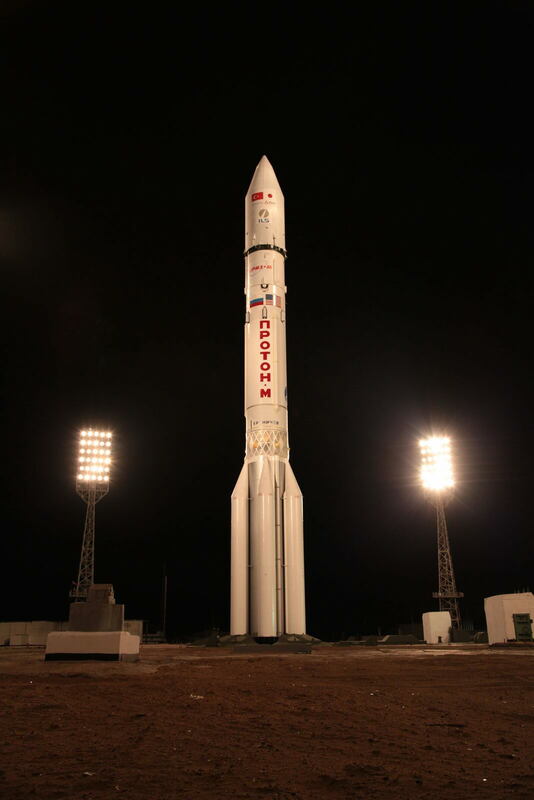 It was the 91st Proton launch for a commercial customer under the auspices of International Launch Services. 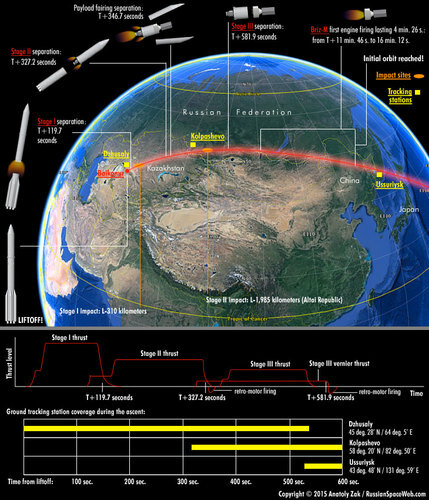 During the delivery of the Turksat-4B satellite, Proton-M followed a typical launch profile for most commercial missions with only seconds in variation from the ascent timeline during the launch of the Turksat-4A satellite on Feb. 16, 2014. A Proton-M/Briz-M launch vehicle took place exactly as scheduled from Baikonur Cosmodrome's Pad 39 at Site 200 on October 16, 2015, at 23:40:11 Moscow Time (4:40 p.m. EDT). The first, second and third stages of the launch vehicle used a standard ascent trajectory matching the orbital inclination of 51.5 degrees toward the Equator, to place the payload section including a Briz-M upper stage and the Turksat-4A satellite into a sub-orbital trajectory. According to the Russian space agency, Roskosmos, the ascent to the initial parking orbit went as planned. A Long March 3B rocket launching the APSTAR-9 satellite from the Xichang Satellite Launch Centre at 16:16 UTC on October 16, 2015. China has launched the APSTAR-9 communications satellite on a Long March 3B rocket from the Xichang Satellite Launch Centre in Sichuan province. The Long March 3B, the most powerful Chinese rocket currently in service, blasted off at 16:16 UTC on Friday (00:16 SaturdayBeijing time). Around 26 minutes after liftoff the Xi'an Satellite Monitoring Centre reported the satellite had successfully entered transfer orbit after separating from the rocket. 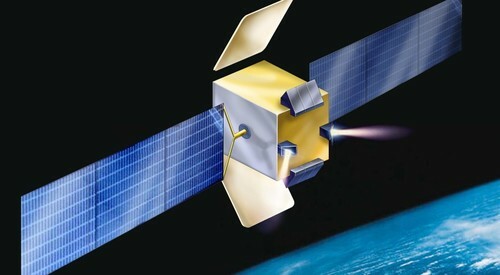 APSTAR-9 was launched for the APT Satellite Company Limited of Hong Kong, a leading regional satellite operator. The China Great Wall Industry Corporation was contracted to design, develop and launch the satellite. The satellite is expected to deliver telecommunications and broadcasting services to customers across the Asia-Pacific region. 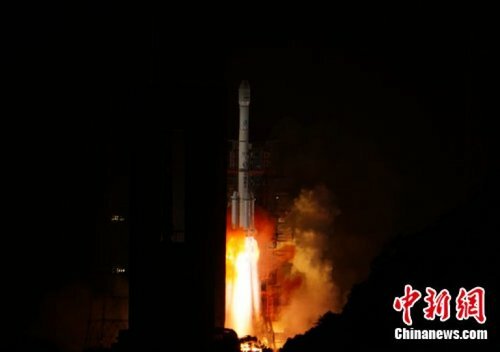 Nasaspaceflight.com reports that developing and delivering a satellite to a leading international satellite operator represents a breakthrough for China’s space industry. Amateur footage of the launch was posted on Sina Weibo shortly after liftoff. 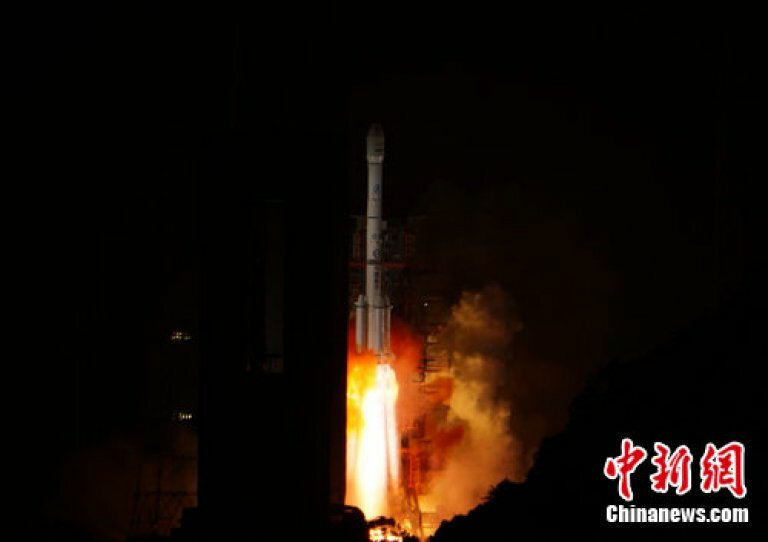 Friday's launch was China’s 11th in 2015, following missions involving four Beidou global positioning satellites, the Gaofen-8, Gaofen-9 and Yaogan Weixing-27 earth observation satellites, a classified ka-band communication test satellite, the Long March 6 debut, lofting 20 small satellites, the maiden flight of the solid-fuelled Long March 11, and Jilin-1, China's first self-developed commercial remote sensing satellite. Earlier in the year, the China Aerospace Science and Technology Corporation, the main contractor for China’s space activities, announced it would perform up to 20 separate launches in 2015, meaning a hectic final quarter of activity. The launch was the 214th of China’s Long March rocket families. The first took place in April 1970, when a Long March 1 rocket put China’s first satellite, Dong Fang Hong-1, into orbit. Next year the new heavy-lift Long March 5 and medium-lift Long March 7 rockets, designed to launch and service China’s future space station and perform lunar sample return missions, will make their debut launches. There will also be the first crewed space mission since 2013, Shenzhou-11, which will dock with China’s upcoming second space lab, Tiangong-2. In October Chinese state media revealed discussions onpotential deep space exploration, including missions to Mars, Jupiter, asteroids, and, in the longer term, a crewed deep space mission. India will launch six satellites from Singapore, including a dedicated 500kg earth observation spacecraft, in mid-December, a top space official said on Friday. "The 500kg dedicated satellite (TeLOS-1) will be a commercial launch for Singapore Technologies Electronics Ltd while five other smaller satellites are from Singapore universities," Indian space agency's commercial arm Antrix Corporation Chairman and Managing Director V.S. Hegde told IANS in Bengaluru. The polar satellite launch vehicle (PSLV), the most reliable workhorse and trusted rocket of the Indian Space Research and Organisation (Isro), will deploy the satellites into a near equatorial orbit, inclined 15 degrees lower to the south of equator. "As Singapore has a cloudy weather most of the year, the observatory satellite will be put in a sun-synchronous polar orbit 550km above the earth so that it could transmit signals round-the-clock, cloud disturbances notwithstanding," Hegde said on the margins of a defence and aerospace seminar. According to the company subsidiary, (Satcom & Sensor Systems Pte Ltd), its first commercial satellite will carry an electro-optical camera capable of taking images at ground resolution of one metre. "The observatory spacecraft will be used disaster and environment monitoring, maritime safety, urban planning and homeland security," Hegde noted. 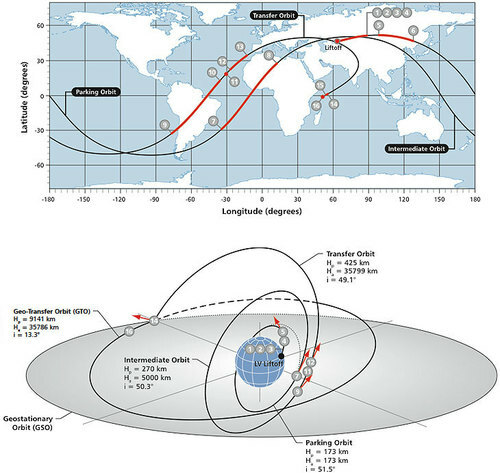 The remote sensing satellite's positioning in the unique near equatorial orbit also allows its frequent revisits to areas of interest in equatorial regions at 96-minute intervals, delivering high data availability and responsiveness. India will also launch another 900kg dedicated communication satellite (Aisat) for the German space agency (GLR) in 2016 from its spaceport at Sriharikota in Andhra Pradesh. "Of the 23 satellites we have commercially contracted for launches in the earth's lower orbit from nine developed and developing countries, 21 smaller, micro and nano type are from Algeria, Canada, Indonesia, Japan and the US for communication, remote sensing, observational activities," Hegde added. With demand for launching 1,500 satellites for various space and science applications from countries the world over, India is ramping up its capacity to launch as many of them, in view of its cost competitiveness and record expertise in sending them in lower orbits using PSLV over the decades. Earlier, Hegde addressed a gathering of about 300 scientists, engineers, technologists and students of aeronautics at a seminar on "Developing and sustaining a vibrant R&D for aerospace and defence sector', organised in memory of late former president A.P.J. Abdul Kalam in Bengaluru by the Society of Indian Aerospace Technologies and Industries. 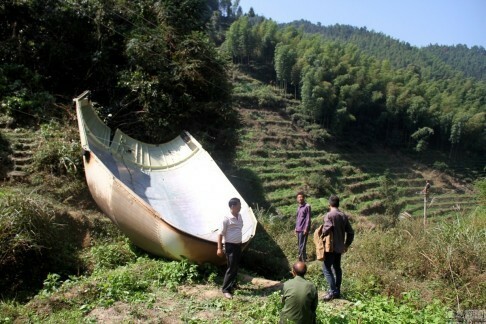 Villagers in southeastern China awoke this weekend to find a metal chunk from a space rocket had narrowly missed their homes as it fell to earth, slamming instead into a nearby hillside, state media reported. The piece, measuring about 10.3 metres long and 4.5 metres across, had broken off the rocket that launched the APSTAR-9 satellite, launched from Xichang in Sichuan province shortly after midnight on Saturday. It wasn't clear what happened during the launch that caused the debris to fall. But the report carried on the website of People's Daily called the launch a success. Residents of Yuanxi village in the southeastern province of Jiangxi might take a slightly different view. 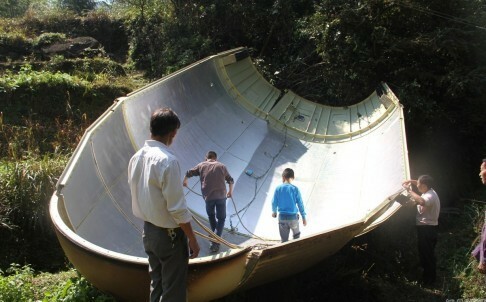 They found the gleaming white sheet of metal on a hillside not far from their residences. The debris had severed the electricity supply in the area but otherwise had not caused any damage. The APSTAR-9 satellite was launched by the China Aerospace Science and Technology Corporation. Пуск РКН "Протон-М" с КА "Turksat-4В"
PARIS — The chief executive of launch service provider Arianespace on Oct. 21 said the company is likely to finish the year with revenue of 1.4 billion euros ($1.56 billion), slightly ahead of 2014, having conducted a record 12 launches. In testimony to the French Senate’s economic affairs committee, Stephane Israel said Evry, France-based Arianespace has booked nearly 2 billion euros in new orders this year, bringing its backlog to more than 5 billion euros and maintaining its market share at 50 percent. The backlog is composed of launch contracts for 21 Ariane 5 heavy-lift rocket missions, 21 medium-lift Soyuz launches — for startup OneWeb’s Internet constellation — and 10 orders for Vega light-lift rockets, including a commercial order from Google’s Skybox for its Earth imaging satellite constellation. Israel said the health of Arianespace, coupled with the commitment of European governments, led by France, to inject some 800 million euros per year into the launcher sector through 2024, makes it a good time for Ariane 5’s work force to reduce costs. The 800-million-euro commitment from member governments of the European Space Agency, made in December 2014, is divided into ongoing price supports and other financing of the Ariane 5 and current Vega rockets, and development of the new Ariane 6 and upgraded Vega C rockets to fly starting at the end of this decade. To keep competitive with Hawthorne, California-based SpaceX’s Falcon 9 rocket and the future Falcon Heavy, Arianespace has reduced prices for lighter satellites occupying the lower berth on an Ariane 5. Heavier satellites, where Arianespace has faced less competition in recent years, are placed into the upper berth. A corresponding reduction in Ariane 5 costs — rocket production, launch activities and ground network — is necessary to avoid having Arianespace’s financial accounts plunge again into the red, Israel said. The goal: a 5-6 percent cost reduction in total Ariane 5 costs by 2017. In return for funding Ariane 6, European governments insisted that the annual price support payments they make to Arianespace to keep it from losing money — 100 million euros per year on average — cease once the new rocket is operational. A first launch is scheduled for 2020, with a three-year phase-out of Ariane 5 to follow. Europe’s rocket industry in turn has won greater autonomy in the operations and production of Ariane 6. Ariane 5 prime contractor Airbus Safran Launchers at the end of this year will purchase the 34.7 percent of Arianespace equity now owned by the French space agency, CNES. European governments have agreed to guarantee Arianespace at least five Ariane 6 satellite launches per year, and three Vega C launches. Arianespace, Airbus Safran Launchers and the rest of the Ariane and Vega industrial team will then be on their own in the larger commercial market in terms of prices, profit and loss. But some details remain to be worked out, especially who is responsible for the unforeseen spending that will accompany an Ariane 6 failure, investigation, down time and eventual return to flight. “That is not entirely clear at this point,” Israel said. SpaceX has made reuse of the Falcon 9 rocket’s first stage a high priority, a decision that Europe’s launch sector has not made. Israel said Arianespace’s initial assessment is that a rocket would need to launch 30 times per year to close the business case for a reusable stage given the cost in energy of returning the stage, refurbishment and the fact that reuse means a smaller production run and thus higher per-unit costs. “We will never be launching 30 times per year,” Israel said, and for now Arianespace is preserving all its rocket’s propellant to carry payloads into orbit, and none to return a stage or the engines. 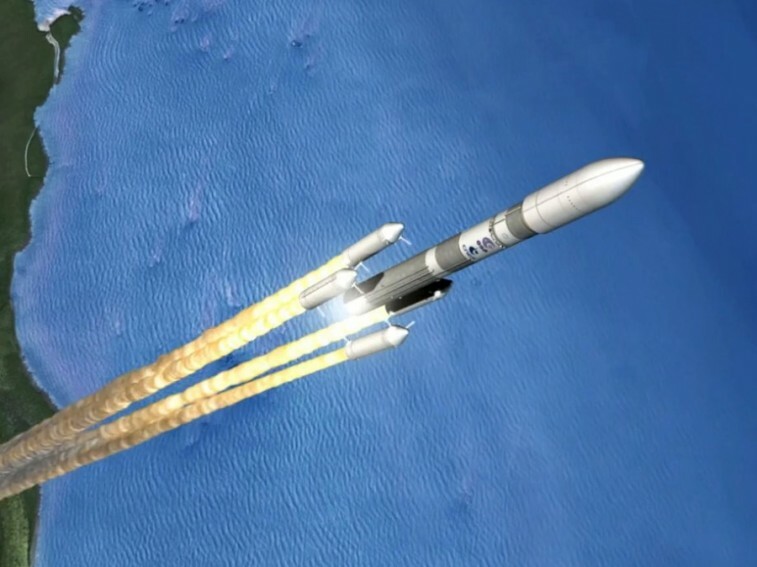 In keeping with France’s Law on Space Operations, however, Arianespace will be forced to load the Ariane 6 cryogenic upper stage with sufficient fuel to complete its satellite delivery mission and then to lower its orbit to permit a controlled re-entry into the atmosphere. The current Ariane 5 costs 150-170 million euros to build and launch. Ariane 6’s cost goal is 90 million euros, or $100.3 million at current exchange rates. It would be sold for $120 million per launch, with two satellite customers per launch of the heavier Ariane 64 version. A $60 million price per customer, Israel said, is close enough to what SpaceX charges today, although he said the company has shown it is able to price below that level. While the Arianespace-SpaceX competition is a focus of the commercial satellite industry, the SpaceX-United Launch Alliance battle for U.S. Defense Department business is even fiercer. It is not just the volume of U.S. military orders that launch vehicles can expect or the higher prices that rockets can charge, it is also the way the U.S. military pays for its launches, Israel said. There is much more up-front cash compared with the commercial market. Israel said he is not worried about India’s new geostationary launch vehicle for the moment beyond the fact that it will take away some Indian government business from Arianespace. Similarly, he said China will not be a competitive threat to Arianespace so long as the U.S. government maintains its ban on the export to China of U.S.-built satellite parts. The ban, collectively known as the International Traffic in Arms Regulations, has kept out of Arianespace’s way a formidable competitor with a large domestic market, he said. Initially a two year mission, funding for IBEX has been extended through 2017, with the potential for mission extensions well beyond that. The latest National Research Council Decadal Survey on Heliophysics emphasizes the urgent need for additional research in this area. NASA's Interstellar Boundary Explorer (IBEX) reached a milestone in its seven-year mission today with the publication of 14 papers in a special issue of The Astrophysical Journal Supplement. Data from IBEX, led by Southwest Research Institute (SwRI), allowed the team of international researchers to provide the most definitive analyses, theories, and results about the "local" interstellar space to date. The IBEX spacecraft, which launched in 2008, uses energetic neutral atom imaging to examine how our heliosphere, the "bubble" in which our Sun and planets reside, interacts with interstellar space, the environment outside of the heliosphere. IBEX created the first global maps showing these interactions and how they change over time. IBEX also directly measures interstellar neutral atoms flowing into the solar system; the journal's special issue focuses on these particles. "Over the past six years, this fundamental work focused on our place in the solar system has become the gold standard for understanding our Sun, our heliosphere, and the interstellar environment around us," said David McComas, principal investigator of the IBEX mission and assistant vice president of the SwRI Space Science and Engineering Division. McComas was the lead author the special issue's overview paper. Eight papers highlight the interstellar helium measurements taken by IBEX and NASA's Ulysses spacecraft (launched in 1990) - the only two spacecraft to have directly measured the local interstellar flow of these helium atoms. The studies resolved an inconsistency in the direction and temperature of the interstellar flow in the data gathered by Ulysses compared to those taken by IBEX. Both data sets now confirm that the local interstellar flow is significantly hotter than believed previously from the Ulysses observations alone, and provide a great deal of insight into the direction the heliosphere is moving through the local material in the galaxy, as well as how fast it is traveling. Two papers examine aspects of determining the composition of interstellar particles, looking closely at oxygen, helium, and neon, as well as how those and other particles are effectively measured. The final four papers discuss analysis techniques and related theoretical considerations, such as the effects of radiation pressure and how planetary gravity affects the course of neutral atoms as they travel through the heliosphere. "Collectively, these studies, along with previously published papers related to the IBEX interstellar neutral observations, open a completely new window on the local interstellar environment, its composition, its properties, and the likely processes at work in the interstellar space around the Sun and in the heliospheric boundary region," said McComas. One concept for a follow-on mission is the Interstellar Mapping and Acceleration Probe (IMAP), which the Decadal Survey recommended as an approximately half-billion-dollar, principal investigator-led mission for the NASA Solar Terrestrial Probes line. IMAP would use a combination of significantly higher resolution and sensitivity to build on the fundamental groundwork laid by IBEX. Team members involved in papers for The Astrophysical Journal special issue were SwRI; The University of Texas at San Antonio; Space Research Centre of the Polish Academy of Sciences, Warsaw, Poland; University of Chicago; Physics Institute, University of Bern, Switzerland; Space Research Institute of Russian Academy of Sciences, Moscow; Lomonosov Moscow State University; Institute for Problems in Mechanics, Russian Academy of Sciences, Moscow; Space Science Center, University of New Hampshire, Durham; and Naval Research Laboratory Space Science Division, Washington, D.C.; Max-Planck-Institute for Solar System Research, Katlenburg-Lindau, Germany; Department of Physics and Astronomy, Dartmouth College, Hanover, N.H.
Astrosat, India's "mini me" Hubble, was launched on 28 September, 2015...and has been going through some checkouts...and it is working real well. The Scanning Sky Monitor (SSM) will monitor the transient X-ray sky to detect and locate X-ray sources in its large Field Of View (FOV). It comprises three almost identical detector units each with a 1D coded-mask and the respective electronics. 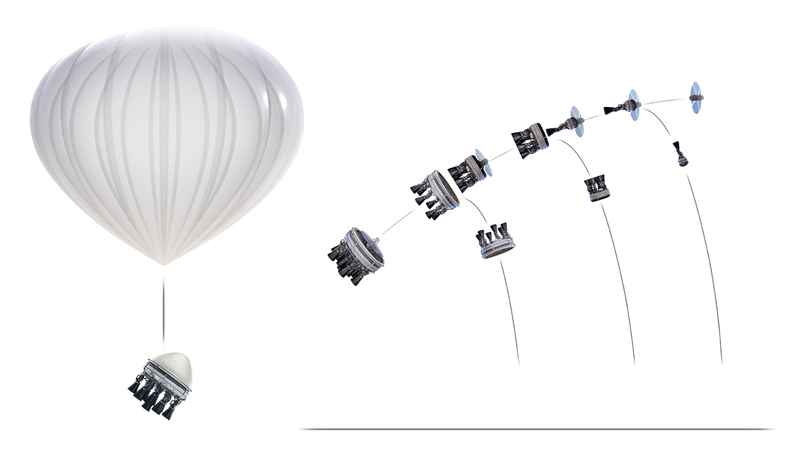 All the three modules of SSM are mounted on a single platform capable of rotation. A photograph of the SSM payload on is shown above. The Processing Electronics and the Platform motor drive electronics are placed inside the spacecraft body. SSM platform deployment was done on the day of launch after spacecraft injection into the intended orbit, soon after solar panel deployment. On Day 2 and Day 3 (September 29 & September 30, 2015) operations related to SSM platform rotation were carried out successfully, as planned. All the modes of rotation were checked and the parameters were verified. Scanning Sky Monitor (SSM) onboard ASTROSAT has been operational since October 12th 2015, on the 15th day after the successful launch of ASTROSAT on 28th September 2015. The temperatures of all the packages of the payload have been within the expected limits. Spacecraft was oriented in such a way that the well-known X-ray source "Crab" was positioned at the centre of Field Of View (FOV) of two of the SSM units, SSM1 and SSM2, which have a crossed FOV. SSM1 was powered ON first and all the health parameters of the unit were monitored and found satisfactory. High Voltage (HV) to the anodes was increased step by step to the required value with constant monitoring of telemetry parameter. Once the required HV step was attained in the SSM1 unit, the counts detected by the unit were indicated in the telemetry. It was exciting to observe the expected count rates in the telemetry as soon as the HV was raised to the required step. The data from SSM1 unit was played back in the subsequent orbit and analysed for the light curves and spectra from all anodes in that unit. The SAA entry and exit operations to lower the HV of the unit for safe operations were handled with macros on-board. The prompt execution of these macros during the non-visibility period during the passage through SAA region can be seen in the later part of the light curve. Following the successful power ON of SSM1 unit the other two units SSM2 and SSM3 were also powered ON, two orbits later during the visibility period. 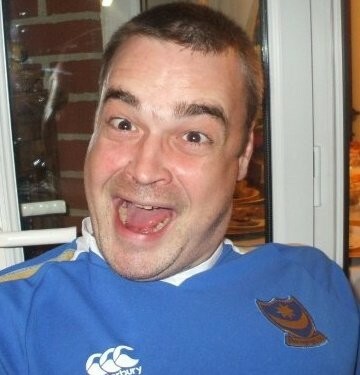 All the health checks were found satisfactory. The units were powered ON one after the other. The data play back was done in the subsequent orbits. Performances of these two units were also as expected. The sky image observed by SSM with its first observation with Crab at the centre of its FOV is shown here in figure 2. "Crab" was detected at the centre of the FOV as expected.